ETC Group publishes a world map of geoengineering – the large-scale manipulation of earth or climate systems. While there is no complete record of the scores of weather and climate control projects in dozens of countries, this map is the first attempt to document the expanding scope of research and experimentation. 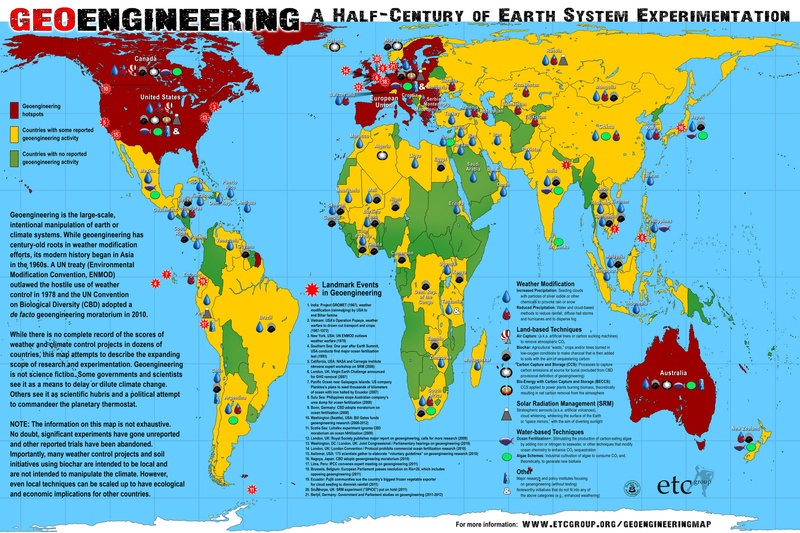 Almost 300 geoengineering projects/experiments are represented on the map belonging to 10 different types of climate-altering technologies. In addition to the map, two tables of references are also available for download. These provide information on the projects/ research/experimentation represented on the map. One table [GeoMap-References.pdf] gives information on geoengineering research and experimentation; a second table [GeoMap-WMinfo.pdf] provides details on weather modification projects. The World of Geoengineering: A Half-Century of Earth System Experimentation by Jim Lee is licensed under a Creative Commons Attribution-NonCommercial-ShareAlike 4.0 International License. Based on a work at climateviewer.com/. Permissions beyond the scope of this license may be available at climateviewer.com/terms.